In an Annapolis studio, dancers stand quietly at attention, hands are palms down at their chests, and elbows are out. The teacher strikes a gourd drum, and the dancers call out a phrase in Hawaiian, introducing a chant and choreography dedicated to King David Kalākaua, the nineteenth-century monarch credited with bringing hula back to the forefront of Hawaiian culture after its suppression by colonial and missionary influences. The rhythm begins; feet step in unison, arms extend into subtle motions, and breath flows more forcefully. While this is a familiar ritual of music and dance in Hawai’i, few Annapolitans know that hula has many devoted local practitioners. My family connection to Hawaiʻi starts in the late 1800s by way of Portuguese and Ukrainian immigrants who came to work on sugarcane plantations on the island of Kauaʻi, and later, Maui. Though I grew up in Annapolis, my childhood was flavored with Hawaiian words, music, and food. Every summer for the past eight years, I have traveled to the island of O’ahu to study with kumu hula (hula master) Māpuana de Silva. 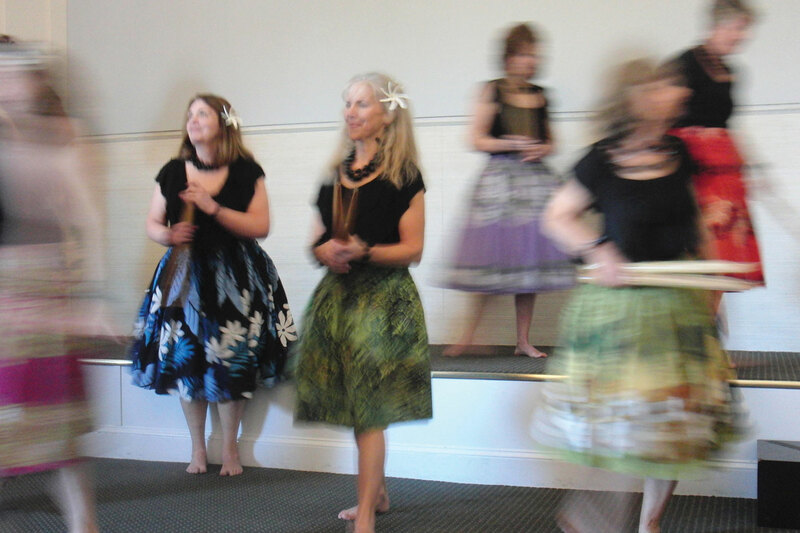 I teach for a hula group called Annapolis Hula at Maryland Hall for the Creative Arts, and there are two other hula groups within 25 minutes of the city. Many of the students have a family connection to the Islands, and some are of Hawaiian ancestry, but more had their interest in the dance sparked by vacations in Hawai’i or by other encounters with Hawaiian music and culture. I met with students and teachers from all three groups to find out why there is such a desire for hula in the area, and what keeps practitioners fascinated with the ancient practice. 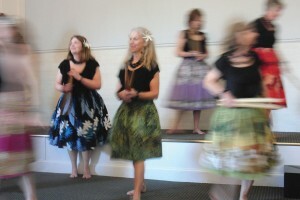 Traditionally practiced by both men and women, hula can be executed at high or low intensity. All ages can participate. In 1975, Kas Nakamura of Pasadena started her school, Hālau Pulama Mau Ke Aloha Ka ‘Ohana ‘Ilima, after studying and performing in Hawai’i for several years under two kumu hula on O’ahu. Nakamura has had ten strokes, but continues to dance, leading her group with the assistance of her advanced students. Though she has lost part of her vision, her doctors have remarked on her admirable sense of balance. “They couldn’t figure it out,” she says. She credits decades of dancing, exclaiming gleefully, “That’s thirty-plus years of hula!” Nakamura’s students enjoy the physical challenge, their dedication to the dance sustained by studying its associated music and culture. “If you’re doing exercise and you don’t enjoy it, you’re not going to stick with it,” says Nakamura’s student and teaching assistant, J. J. Peterson. Annapolis Hula student Vicky Swain speaks of the unique sense of well-being that she experiences from dancing, stating simply, “It balances me for the week,” a sentiment that elicits nods of agreement from her classmates. In all of my visits with area teachers and students, there was a feeling of camaraderie, marked by smiles, hugs, and easy laughter. Many mentioned the concept of aloha, a generosity of spirit toward one another, which tends to spill out into their everyday lives. Those who are inspired by nature find that hula fosters a deeper appreciation for their environs through frequent references to plants, animals, land, and sea. 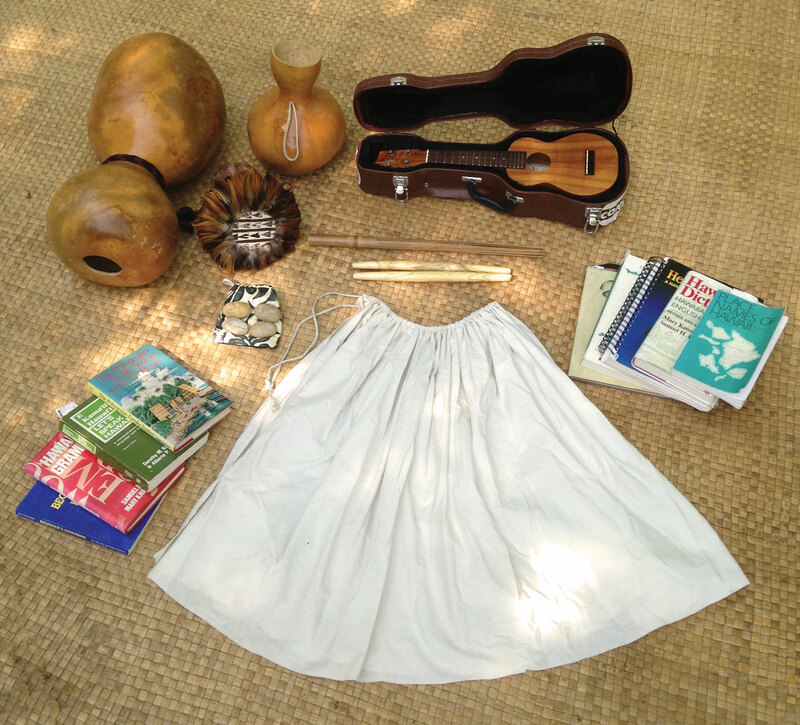 Nancy Law, an airline pilot who has studied with Annapolis Hula for ten years, spends her free time working as a wildlife advocate. “I feel a soulful connection with Hawai’i because of [Hawaiians’] love of the land,” she says. Error: Error validating access token: Session has expired on Saturday, 09-Mar-19 15:57:50 PST. The current time is Tuesday, 23-Apr-19 08:52:18 PDT.